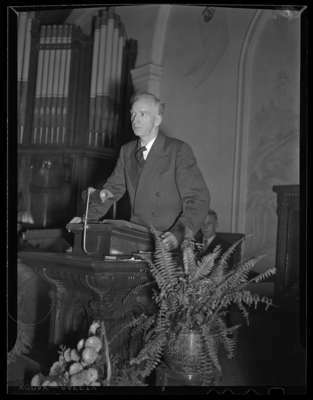 Oswald Smith at the pulpit of Whitby Baptist Church. Oswald Smith was a Canadian pastor and evangelist who is best known as a pastor of The Peoples Church in Toronto. The Peoples Church in Toronto got its name on October 1, 1933. It operated from 100 Bloor Street East, Toronto, Ontario from July, 1934 – October 28, 1962. Afterwards it moved to its present location at 374 Sheppard Avenue East, Toronto, Ontario. This Peoples Church began in Toronto in 1928 and was known as The Cosmopolitan Tabernacle. Later it changed its name to The Toronto Gospel Tabernacle. The Whitby Baptist Church was built in 1869 at the corner of Colborne and Centre Streets as a Canada Presbyterian Church. In 1875 it joined with St. Andrews Presbyterian Church. The next year it became Whitby Baptist Church and operated in that building until 1967 when a new church was built on Gilbert Street East. The building was demolished in 1977. Oswald Smith, December 1, 1948, Marjorie Ruddy. Whitby Archives A2013_040_1237.